The Samsung Galaxy Note 3 has a feature to use text-messages to rejection phone calls. Rather than simply dismiss a call, you can use the tab at the bottom of the Incoming Call screen to display a list of text message replies. Choose one to send that text message to the caller, which you may find far more polite than dismissing the call outright. After you touch the Send button, the incoming call is dismissed. In a few cellular seconds, the person who called receives the selected text message. At the Home screen, press the Menu button. Choose Settings to open the Settings app. Choose the Device tab atop the Settings app screen. Choose Set Call Rejection Messages. You see the Reject Messages screen. It lists current messages and lets you create new, better ones. To create a new message, touch the Create button or choose an existing message to edit or replace it. The device has slots for only six messages, so the Create button isn’t available when you have six messages. 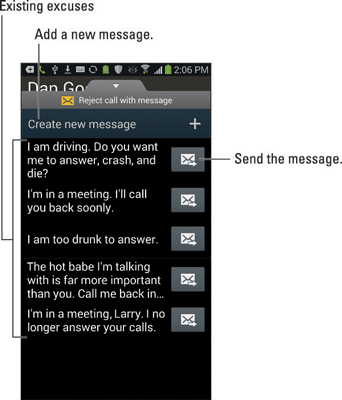 Messages are edited like any other text in the Galaxy Note. Touch the Save button to save the message-rejection text. Your new messages appear the next time you slide up the Reject Call with Message tab. You can have a maximum of six text-message-rejection replies. To delete a message, visit the Reject Messages screen, and long-press the entry you want to remove. Choose the Delete command. Touch the OK button to confirm. Not every phone is a cell phone. Sending a text message to Aunt Linda’s landline phone just won’t work.